We've all seen pictures of simulators that are in use today; modern, highly sophisticated machines that make you feel as if you were actually flying. They are useful training aids and help pilots polish their flying skills and procedures in many areas such as cockpit resource management, flying instrument approaches, dealing with emergencies and abnormal situations, familarization with new aircraft, and flight crew coordination .... all from the safety of being on the ground. 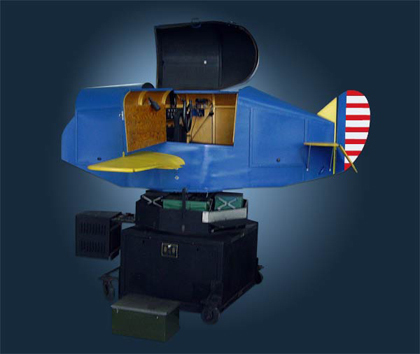 They are amazing machines and have developed considerably since the beginning when men and women started flying. 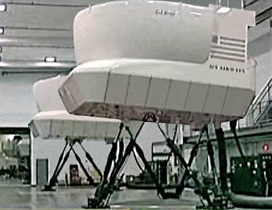 Even the modern desktop and laptop computer flight simulators are far ahead of what was used in the past for ground based flight training. Have you ever wondered what some of the early simulators were like? I have and found some interesting simulators from yesteryear. 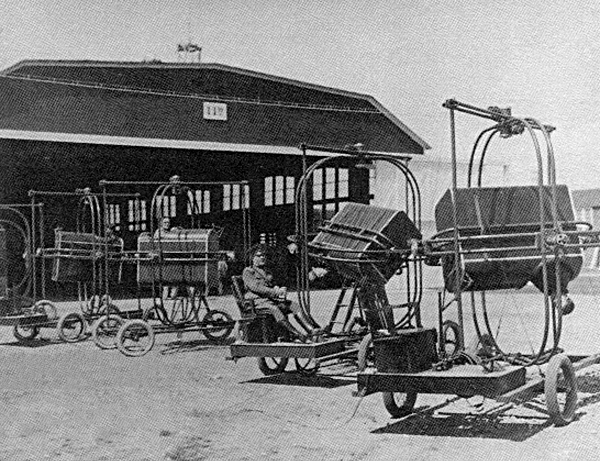 This is a photograph of one of the earliest ground simulators (photo circa 1911). Two half-sections of a barrel were moved manually which represented the pitch and roll of an airplane. The student pilot was then required to line up a reference bar with the horizon. Although not a true synthetic simulator, this is a 1917 Breese Penguin. The "Penguin" was intended to be just as unmanageable as real aircraft, thus they had no brakes or steerable wheels - which made them quite difficult to control. This is the 1917 "Ruggles Orientator". 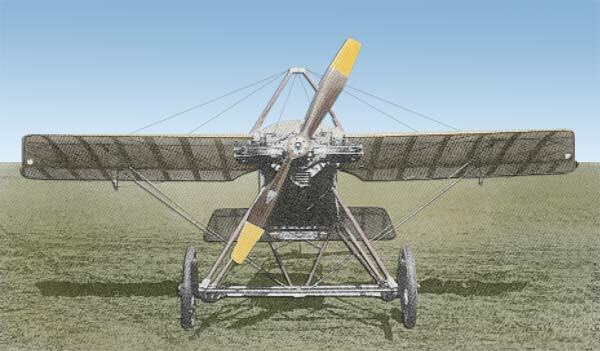 It consisted of a seat mounted within a gimbal ring assembly that enabled full rotation of the student pilot in all three axes (pitch, yaw, and roll) and a fourth additional vertical movement. 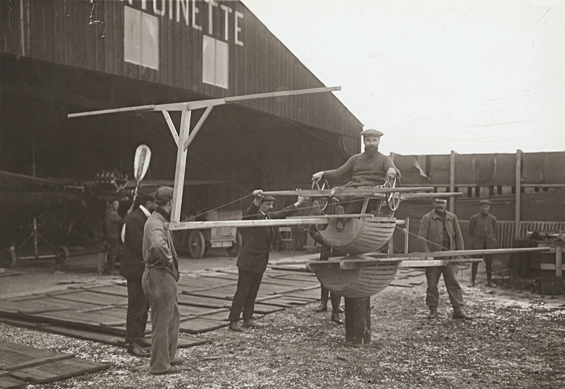 All motions were controlled by rudder bars and sticks by the instructor and student pilot which operated electric motors to produce the desired flight attitudes. The goal was to train students to recognize and recover from unusual attitudes that might be encountered in flight. *Note the position of the student pilot in the far right simulator and the fact that there is no instructor! The next major advancement in simulators came in 1929. 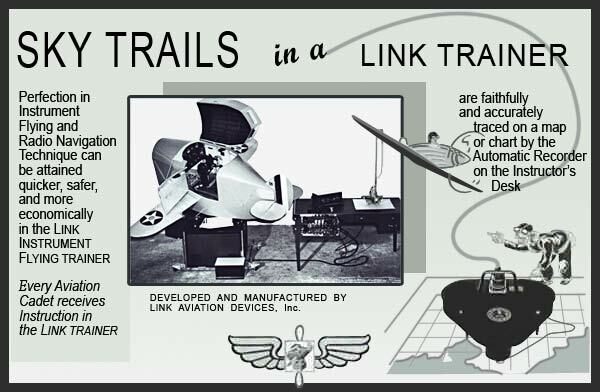 The Link trainer invented by Edwin Albert Link is easily one of the most recognized early simulators. They were produced and used from 1934 through the late 1950's. Just as this ad says, "Every aviation cadet receives instruction in a Link Trainer"....and that's not an exaggeration because 10,000 units were produced and thousands of pilots trained in them, especially during WWII. Known as the "Blue Box" to the student pilots, these trainers kept pace with the increased instrumentation and flight dynamics of aircraft of their period, but retained the electrical and pneumatic design fundamentals pioneered in the first 1929 Link prototype. There are two major components to the trainer, the first is the trainer itself which is connected via universal joint to the base. Inside the cockpit is a single pilot's seat, stick and rudder controls, and a full suite of flight instruments. The base contains several items: complicated sets of air-driven bellows to simulate 3 axis motion, an air compressor (powers the motion bellows and some of the aircraft instruments), and a "Telegon Oscillator" which controls the remaining instruments. 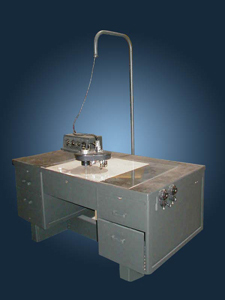 The second major component is an external instructor's station, which consists of a large map table, a repeated display of the main flight instruments, and a moving marker known as a "crab." The crab moves across the glass surface of the map table, plotting the pilot's track. The pilot and instructor would communicate with each other via headphones and microphones. Both the trainer and the instructor's station are powered from standard 110VAC/240VAC power outlets via a transformer, with the bulk of internal wiring being low voltage. Simulator logic is all analog and is based around vacuum tubes. The Link trainer is really the beginning of modern flight simulators because they all incorporate many of the innovations that were found in this trainer....3 axis motion, pilot / instructor radio communcation, flight tracking, full cockpit instrumentation, and to some extent aircraft specific duplication (the instrument layout of the ANT18 Link is that of the AT-6 and SNJ aircraft). All that would be needed to complete the formula is a visual element. The first airline to own a full aircraft simulator was Pan American Airways in 1948. Curtiss-Wright developed the simulator for use in training crews flying the Boeing 377 Stratocruiser. 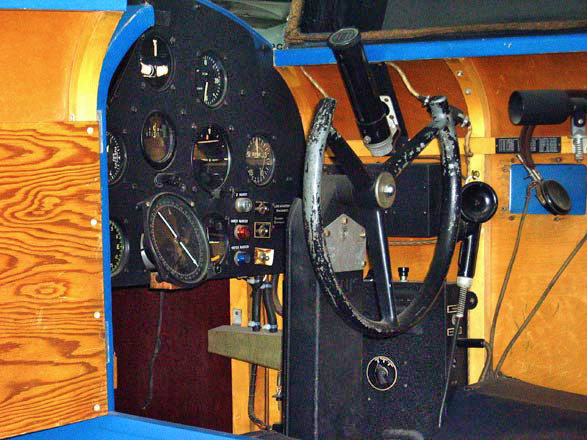 No motion or visual systems were installed, but in all other respects the simulator duplicated the appearance and behavior of the Stratocruiser cockpit. Instructors could introduce emergencies or abnormal situations on a fault insertion panel or "trouble box" to train flight crews procedures and coordination in order to solve in-flight problems. In addition, complete routes could be flown, as in real life, using the same navigational aids. By 1958 it was all beginning to come together. 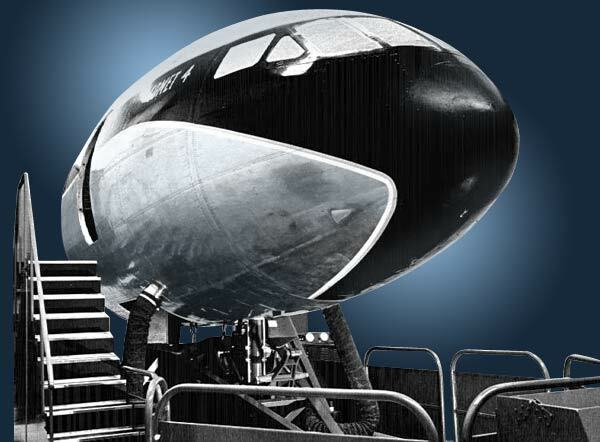 BOAC (British Overseas Airways Corporation) had contracted Redifon to develop a full motion simulator for the Comet IV aircraft. The simulator was beginning to look more like what is in use today but realistic visual aspects were yet to be used. It wasn't until 1962 when the first color system was produced by Redifon, utilizing television technology, that simulators had believable visual references that we are familiar with today.